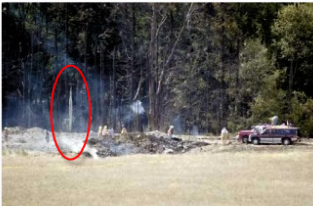 At trajectories of 10 degrees or less, two cruise missiles with 12x60 inch dense-metal penetrating warheads are the most likely suspects for the crater in Shanksville. Please watch this 8-minute video which explains the concept. I have contracted an engineer to supply a finite element analysis of this hypothesis which I hope will be completed soon. 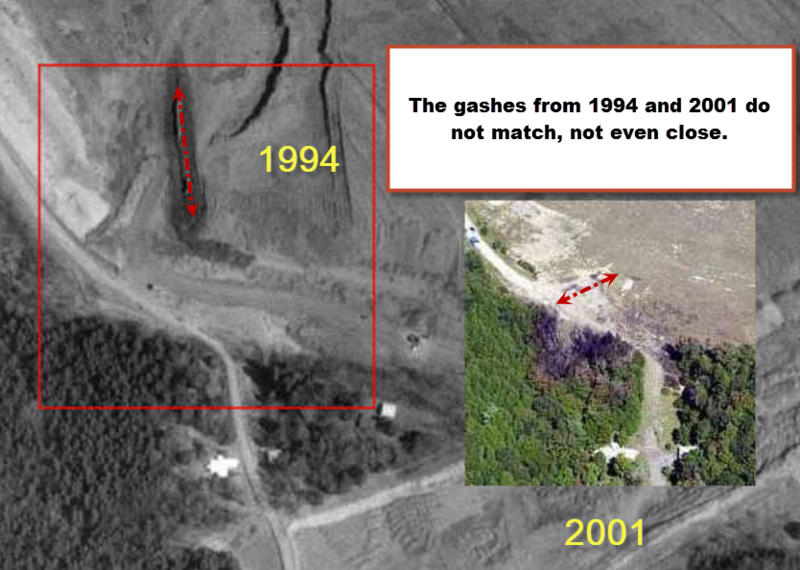 I thought it was here at PFT, but maybe it was elsewhere, that somebody went back to commercially available satellite photos and discovered that the crater at Shanksville was actually there in the several years BEFORE 2001? That claim has been repeatedly debunked. I'm not an NPT advocate but these links may be useful. Thanks. I am well aware of the eye witness accounts, but I'm dealing with the scene of the crime - and I provided the makeup of the soil as part of the detail required for the engineering model. This project deals with the available evidence of the crater, the soil makeup, the characteristics of the missiles and whether or not the warheads can account for the crater. It also deals with whether a jet could account for the crater. If it is shown one could, where the other could not, then the eye witness accounts need to be taken with a grain of salt. The witnesses describe a flyover, or at the very least fatally contradict the official trajectory and as such, the physical nature of the (ridiculous) so called "impact crater". Some of them, including the witness Susan McElwain quoted in your video, corroborate a drone type device in the area just before the explosion. There's no way you can ignore eyewitness accounts. An aircraft being seen in the area doesn't contradict your theory. I stand corrected. I assumed you were referring to the witnesses who claim to have seen the plane impact. My apologies. Obviously I am not ignoring the eyewitness accounts, as I include McElwain's in my video. I am simply trying to ascertain what the most-likely cause of the crater was. My consultant is supposedly modeling the expected results of a plane crash too, and although we will never be able state exactly what happened, we should be able to come to a "most-likely" suspect. Can you explain what exactly you mean has been debunked? The 1994 USGS aerial photo showing the gash? In other words, the dark scar that it was implied would correspond to the wing impacts. If that scar was there before, doesn't that make your two missile hypothesis even less likely. The USGS photo should be provable if it isn't made up. Did you check for it being valid? Or what evidence do you have that it is not valid? I do understand and assume the round crater in the center is new. And if there were two missiles, as you postulate, then are you saying they collided head on to form the round crater (as demonstrated in your video), or that each missile was fired in turn, one at at time? The former would imply two planes carrying missiles, or could both be launched from one plane? Nice video! If a missile made the gouges that represent the wings, the weeds would not still be standing inside the gouge. A detonation sent dirt clumps in all directions! Clumps of soil with long grass tend to roll into ditches grass-side up, as any ditch-digger knows. As the warheads burrowed under ground they undermined the grassy soil at the edge of the gash, making the soil on the edges appear to be growing from the ditch, but the topsoil there was just following the contour of the undermined soil beneath it. Next time you dig a ditch in grassy soil, scoop out the soil beneath the surface and notice how the turf follows the contours of the undermined soil, and then toss a couple dirt clumps with long grass attached to them into the ditch and see how often the soil lands grass-side down. The first missile didn't detonate and acted like a large bullet would, burying under ground. If it was me I would have mounted an electronic targeting beacon within the first warhead and targeted the second one from the opposite direction. At a slight trajectory the second missile would pass over the first warhead (buried under ground) and detonate a split-second later. They could both be launched from one plane but witnesses reported multiple military jet sightings. There were more than two missiles launched, two for the main crater, but something detonated in air burst in the trees. 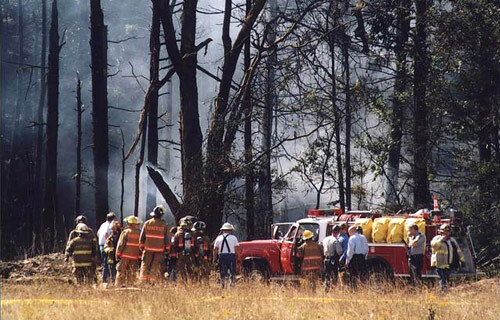 Note the trees behind the posing firemen. Canard? I was not looking at your "clump," I was looking at the dried grass that are on the sides on the ditch. Here is another picture of grass/weeds that are in the ravine. Also, no one saw two missiles nor was there two clouds of smoke from the explosions. Like I said, nice video but there is no evidence of two explosions. As the warheads burrowed under ground they undermined the grassy soil at the edge of the gash, making the soil on the edges appear to be growing from the ditch, but the topsoil there was just following the contour of the undermined soil beneath it. Sure there is. The size of the central crater roughly matches the size of craters made by similarly sized bombs (about 240 lbs), and the smoking trees, specifically the tree trunk split down the middle indicate something detonated there. Why would you expect people to see both or all the missiles? And how do you know the Shanksville photo is genuine? 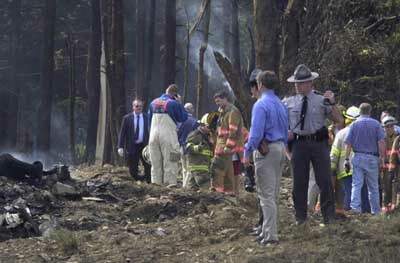 It is a photo of an ordnance blast, but other locals dispute it's authenticity and other descriptions of the crash scene don't match the photographs taken immediately after the alleged crash. I can see grass that is vertical in the ravine. I have read witness accounts of finding shrapnel in the trees. The force of the explosion was directed toward the trees. That is why the trees are burnt and the the dry grass on the other end of the ravine remain. The projectile being only 12 inches wide created a larger version of a scar a bullet would make at a similar trajectory. The 12x60 inch warhead pushed the soil away from the warhead in a conical shape in the direction of travel, and after it buried deeply enough into the ground the topsoil above would be undermined and fall into the trench left by the warhead. The nap of the grass that overlaps the edge of the ravine changes in relation to the slope of the gash, an indication that the soil beneath it was scooped out by the projectile as it burrowed beneath the surface. The long vertical grass in the foreground is just that, in the foreground, and the vertical grass in the trench is attached to sod that fell back into the trench after the warhead passed. This is why there is no vertical grass seen in the shallower sections of the trench. Wally Miller described the cockpit impact exploding like shrapnel. Are you saying the electronics, plastic and aluminum in the cockpit turned to shrapnel that split the tree and set fire to the woods? Wouldn't the tree be split on the other side in that case? 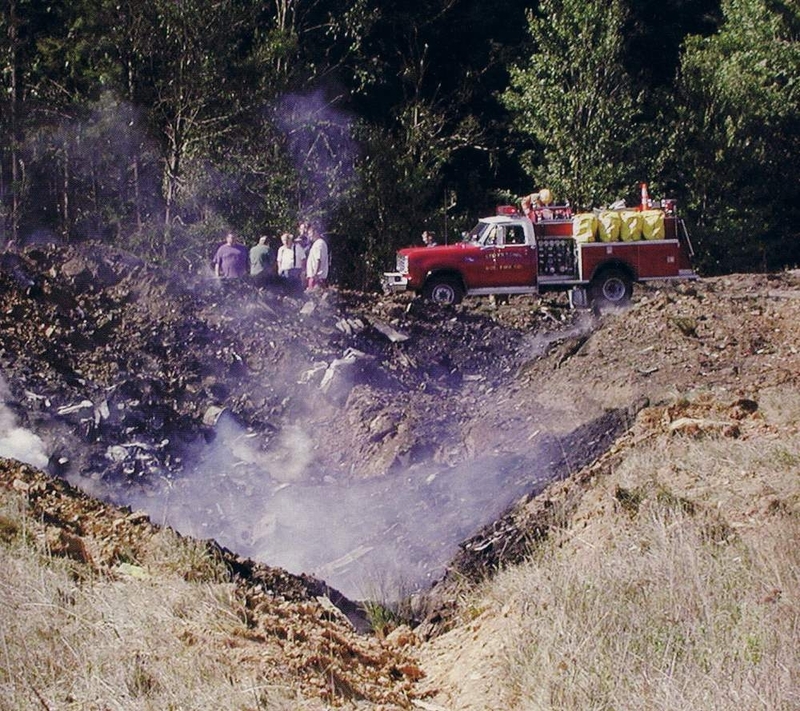 What was in the cockpit that could set fire to the woods? The long vertical grass in the foreground is just that, in the foreground, and the vertical grass in the trench is attached to sod that fell back into the trench after the warhead passed. This is why there is no vertical grass seen in the shallower sections of the trench. 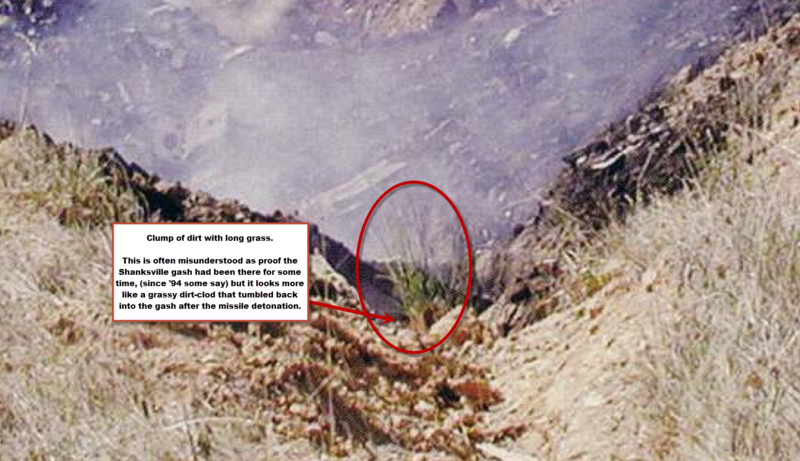 The picture below clearly shows vertical strands of grass in the ravine. The evidence shows that a missile hit that field. But there is no evidence that indicates that two missiles hit the field. The ravine had to have been there before 9/11 because the grass grew in the ravine that is supposed to look like an airplane wing. Not long after the crash, Escherich was on the scene. Emergency personnel were only just arriving. Undetected, he grabbed his camera and set up his tripod and fired off 10 shots before being asked to leave. At that distance he would have plenty of grass in the foreground between the camera and the gash. Zoom in and follow the tall grass down and you'll see they are growing in front of the gash. 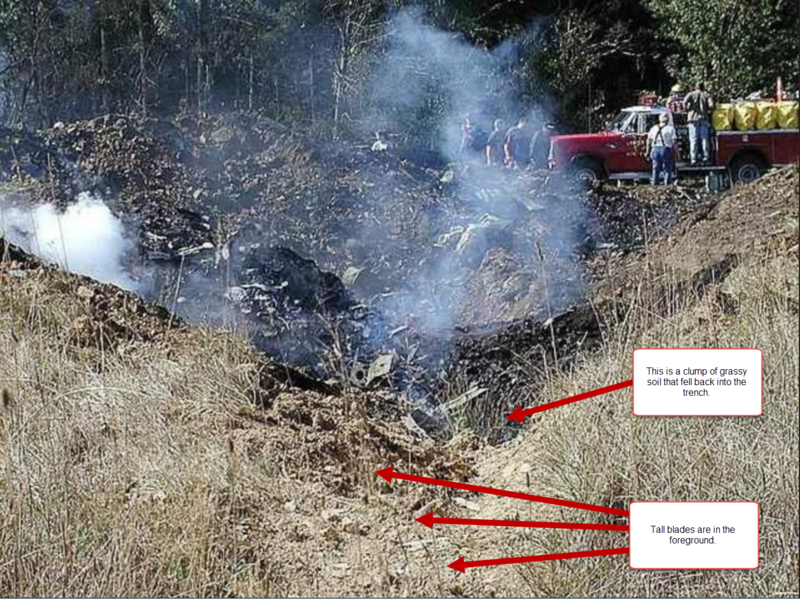 Just for the record, Wally Miller said that he could find nothing that remotely resembled a crashed Boeing with pax. Nada. After the feds showed up and asked him to become a team player, he changed his story. Which do you think is true and accurate? First statement or second? I think he's part of the fraud. I would like to ask the author of this thread, making here the absolutely unsubstantiated claim that AGM158 missile(s) created crater and gashes at the Shanksville site (and elsewhere also that it made the holes in the WTC facade), never answered my comment at his http://911crashtest.org site although made already more than 3 weeks ago. I can create a smaller version of the gash with two bullets and a firecracker. Hows that for substantiation? I didn't respond because I haven't gotten around to reading your post. I am not required to respond in a timely manner. Keep your shirt on. Have you closely examined the photographs of the hole? To me it seems that the central crater looks like it was created after the gashes. So to recap what seems to me be there: first something creates gashes and then something explodes in the middle. But still it seems to me much easier to dig a hole, put the charges in the ground together with some plane parts and then at the appropriate moment press a button. - You don't need two 1million$ cruise missiles, you are quite sure the hole will be like you want and where you want and you don't risk the missiles missing the target. But because I see another (one) aircraft, changing squawk code quite exactly at the moment of the alleged "UA93" crash, approaching and circling then the site, disappearing there from the radar, I can't for now decide what really happened there. And although I find your hypothesis interesting at least certainly I stil don't see any evidence supportive for the AGM158 not speaking two there whatsoever. This site is more about presenting evidence, not unsubstantiated hypotheses and I would bet even the two bullets and firecracker will not be generally accepted here as an evidence for 2 AGM158 hitting there. Okay, sorry about that. Just responded. I am obsessed, so yes; I have examined the available evidence ad nauseam but I'm always looking for something I may have missed. Yes, I agree - something first created the gashes, followed by the central detonation. I have also researched the size of craters made by bombs of similar size to the explosives carried by these missiles, and even that matches. Here's the beginnings of a finite element analysis produced by a flake of an engineer I contracted last year. Know anyone who can finish it (for a fee or not)? But still it seems to me much easier to dig a hole, put the charges in the ground together with some plane parts and then at the appropriate moment press a button. I am a dog person. Until last year when one died I had two dogs I walked rain or shine. I know all the dog parks in the area as well as any nearby fields where I can let the dogs run. I'm sure there are hundreds just like me in Shanksville. How would you suppress the evidence of heavy equipment digging a ditch in the middle of someone's ball-chucking space? Wouldn't the locals be wise to the scam even before it started? The area wasn't fenced off, anyone could walk over there and snap a photo. You don't think it's pretty flimsy to assume no locals would report heavy equipment digging in the exact location that flight 93 crashed? Isn't that a pretty ballsy assumption to make considering what was at stake? An errant photo would be devastating. - You don't need two 1million$ cruise missiles, you are quite sure the hole will be like you want and where you want and you don't risk the missiles missing the target. These people throw billions around like chump change. What are a couple millions invested in cruise missiles compared to the billions on war profits from an endless "war on terror"? But because I see another (one) aircraft, changing squawk code quite exactly at the moment of the alleged "UA93" crash, approaching and circling then the site, disappearing there from the radar, I can't for now decide what really happened there. Thank you for your honesty. I am not a pilot so I can only vaguely understand your lingo but I do understand that the same authorities that have been conducting a 12 year war also control the flow of the information you are referring to. I don't trust the bastards, but that's just me. And although I find your hypothesis interesting at least certainly I stil don't see any evidence supportive for the AGM158 not speaking two there whatsoever. I gather that and I disagree, but I appreciate the feedback nonetheless. You'll note I didn't include that bit in the video. 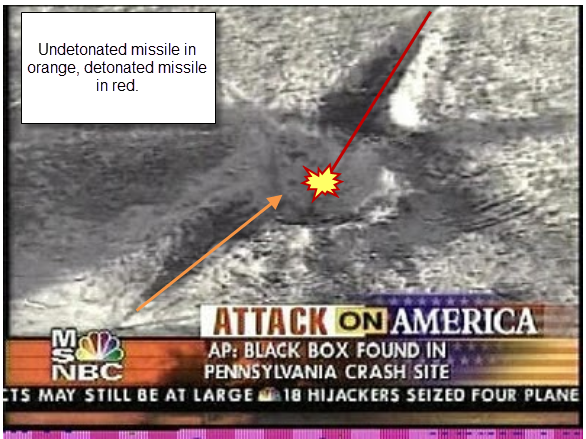 Because missile impact videos are classified, I ised NASA photos and data to support the hypothesis that two cruise missiles with dense-metal penetrating warheads created the crater at Shanksville. But can you admit that even if the crater matches some bombs it is not necessary that they were carried there by cruise missiles? At the time I don't know anybody who would be eager to. It was a former mine. They were digging there for years and from the comparison of the 1994 picture and the visible terrain irregularities there with the 2001 pictures it really very much seems they must have been digging there after the 1994 picture was taken. Did you heard about digging there from anybody? Have you seen photos of that digging, have you heard testimonies of anybody digging there? You didn't? Yeat the pictures show it must have happened. The problem I see is not so much the price, but a precise guidance which would be able to strike two missiles to virtually same spot at good direction and at good incidence angle (10° looks to be very small for the missile not to bounce from the ground - penetrators usually strike at angles close to perpendicular for them to be effective). What would be the reason to insert another plane into the radar record which instead of landing at the closest airport flyies from SW straight to the target with two very symmmetric minor course corrections at very least 200nmi distance relatively long after a national grounding order issued, suspiciously changing squawks (secondary radar identification code) closely circles the site, descends below the radar horizon (at about 5 thousand ft MSL) and disappears there from the radar? Does it somehow help the official narrative of 9/11 that a B757-2 with dozens of thousands lb jetfuel on board and coming from north crashed there? It is not impossible, but what substantial evidence is available for it, especially that it was namely AGM158? I can. Can you admit that it would be stealthier to launch two cruise missiles, one carrying a targeting beacon for the second to target from the opposite direction than it would be to scoop out a gash and bury a bomb? How many days/weeks/months in advance was this done would you recon? I'm not following your thought process. I'm sure they could have buried plane parts in '94. but why bother? How can any of us be certain any of the alleged plane parts supposedly unearthed at the site weren't staged for the camera? Why would they use an excavator to unearth a crime scene? Were they more concerned about the plane parts than the body parts? I would think an archeological dig would be more appropriate had there been real plane parts down there, and if I was a family member of one of the entombed "passengers" I would be outraged that heavy equipment was used. Seems obvious they weren't worried about any of that. If it was me I would have planted an electronic beacon in the first warhead which once buried under ground could be targeted from the opposite direction by the second missile. Such beacons are routinely used these days for targeting people in Pipelinistan and are much more accurate than a laser targeting system. Such stories served as red herrings making it more likely the concerned citizens in the Truth Movement would never stumble upon the truth. There is more evidence in support of cruise missiles than of planted bombs and excavator-dug gashes. 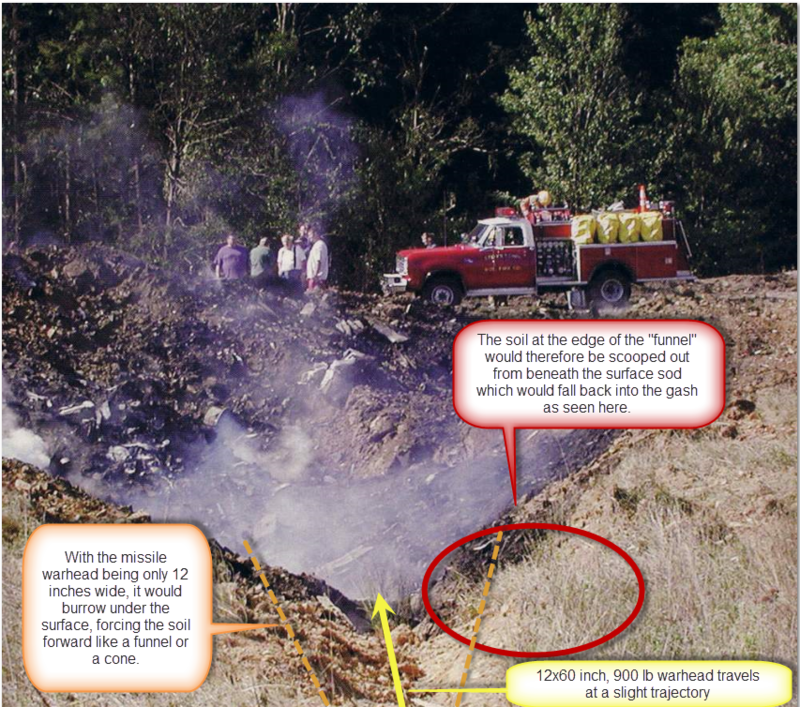 The AGM158 was built using off the shelf technology and carries a warhead that could have accounted for both the crater in Shanksville and the directional damage to the WTC. Few other missiles of that size are known to carry a warhead known as a "bunker buster". The AGM158 was in production but not in inventory, making for plausible-deniability and it's plane-shape when viewed from the ground could be mistaken for a large jet at a higher altitude. It was ideal for the task and can account for the damage evidence. Whether that particular model was used is beside the point that the technology and in fact the missiles were there and in production at the time. There were multiple reports of military jets and small planes. Not every blip is a missile. You need to go way to the right near the back of the firetruck to get to ground level. Everything in the middle of the photos is in the ravine, including lots of grass. You are taking a very solid theory of a missile hitting the center of the ravine and making it impossible. Is it an ego thing or is the goal to discredit the missile theory? While I have no idea of what model of missile was used, Susan McElwain did see a missile fly just above the ground, go over the trees and explode. Of course there is no evidence of two missiles. You mean other than the two gashes and the other witnesses who said they heard missiles. You're hanging your hat on a claim that the gash was pre existing all based on a few blades of grass in a blurry photo taken from 150 yards away. If you had a leg to stand on you wouldn't need to bring up ego. You have absolutely no evidence to support your theory of two missiles. If not ego, why would you stick to a theory when it has been proven to be wrong? Maybe your "blurry" comment is the root of your theory. Try glasses or a higher resolution screen. The photos are not blurry on my computer. Witness accounts, NASA examples of craters and the trajectories of the projectiles that make them, extremely accurate missiles of the right size and capability and multiple reports of the jets that can launch them...hmm...sure sounds like someone is a little light on substance all right. What was that you were saying about blades of grass? But tell me, why would they select a pre existing gully pray tell? Too lazy to dig a fresh one? Please explain it to those of us who are blinded by your brilliance. Because the ravine kind of looked like wings. Witness accounts? Who saw two missiles? You don't have to be too brilliant to figure out the ravine was there before 9/11 if it has grass growing in it. The land is flat except for the ravine. The pictures that show grass on the slopes are of the ravine. Your NASA trajectories of the projectiles cannot cut a ravine and leave the grass standing. If you want to taken seriously you need to correct your mistakes and move on. "Kind of looked like wings?" I see you've given this a lot of thought. You are mistaken about the grass and are literally clutching at straws. You don't think the ravine kind of looks like wings? Then what was the point of firing two missiles in the ground? Use your red marker and show where the grass on the slopes are in the above photo. Did your trajectories of the projectiles take in account the trees to the right of the ravine? Still waiting for the witness accounts that saw two missiles. You don't think the ravine kind of looks like wings? No. I think it looks like the gashes made when I fire bullets into the ground at slight trajectories. I think it looks like the NASA photo of the crater made by a meteor striking at a trajectory of less than ten degrees from horizontal. I think it looks exactly like the crater two meteorites might make striking at ten degree trajectories from opposite directions. Then what was the point of firing two missiles in the ground? To make a strange looking crater that most people would was caused by a jet, strange enough that people who doubted the jet story would be baffled by and assume the gash was already there, which if this was their goal you are living proof they succeeded. Use your red marker and show where the grass on the slopes are in the above photo. Use yours to explain why the grass doesn't fill the whole ditch and is only visible in clumps of soil and around the edges. Use your marker to explain why the grassy clumps did not fall into the ditch after the detonation, and then use it to explain how the grass at the edge isn't curling into the trench after the ground beneath it was undermined, and then use it to explain how the long grass you insist is growing from the ditch is not actually in the foreground. Did your trajectories of the projectiles take in account the trees to the right of the ravine? Still waiting for the witness accounts that saw two missiles. Hold your breath. I'll hold mine for your answer as to why you'd expect each missile to have a witness. Can you admit that it would be stealthier to launch two cruise missiles, one carrying a targeting beacon for the second to target from the opposite direction than it would be to scoop out a gash and bury a bomb? It would be maybe "stealthier", but definitely prone to failure. One doesn't expect a missile hitting ground - at high speed and penetrating it several meters - to stay intact including a homing device. Yes it is remotely possible, but one who pulls a crime of century I would think definitely can't rely on it and risk failure. How many days/weeks/months in advance was this done would you recon? It is not primarily about burrying bombs, but the plane parts, as the jet engine for example. One can imagine it to burry itself in a plane crash, one can imagine it burried by a digger, but one somehow can't imagine it burried by an AGM158 missile. To your question WHEN there is only one answer: whenever convenient for the perps, possibly covered up as part of the mine reclamation. And that's what I find being the problem here. You expect others to follow you truly bizzare thought processes which from no evidence whatsoever makes two AGM158s striking ground precisely at very same place at high incidence angle from opposite directions making just one detonation, yet you repeatedly are not able to follow others, even they postulate much simpler things (here a mere difference of two photographs taken at different times). As it looks you aren't able to follow whenever they question your conjectures. One normally finds hardly imaginable a grown man unable to discern different surface patterns in two pictures of same place taken at diffferent times. Except of course doing it for purpose - to avoid painful questions. Why they should be. They just murdered thousands of people and suddenly they would be tender-hearted that they would care about their bodyparts more than for the hijack-plane show? It doesn't seem plausible And if that what made the crater was a drone, missiles or planted explosives, there obviously wouldn't be any body parts there anyway. Now, seriously, show us the evidence there were ever used homing devices in a warhead of a missile sriking ground at high velocity used then for targeting other missile. Ever. I note that avoiding answer factual questions from other members here often leads to showing of the doors. A "story", "red herring", for "truth movement never stumble upon the truth" you say, so I want evidence that it was like that, because until now it is your AGM158 conjecture which looks to me exactly fitting into you own definition - a red herring. What evidence is there for two AGM158 hitting the place? To me it doesn't look like a production of something somewhere is a proof it was used. It coul'd be the case, but at the time it looks to me as a pure speculation. A missile if deployed from the second plane at the scene (see here and here) would be most probably below PLA radar horizon, which around the site is at least 1 km above ground due to Tonoloway ridge obstructing view. If that was true, the missile would have exploded in the trees. The trees were too thick and too tall to allow the missile to come in from the west at a 10 degree trajectory to hit the ground. At least it would have left an 8' hole in the trees. Because the grass is growing out of the ground! I expect each missile to have a witness because you claimed there were witness accounts! Your theory is not only not plausible. it is not possible. It would be maybe "stealthier", but definitely prone to failure. Yes it is remotely possible, but one who pulls a crime of century I would think definitely can't rely on it and risk failure. Too outlandish you say? Well I say your inability to even consider the option is proof that it was more likely to succeed. Such incredulity is what 'big liars' count on. One doesn't expect a missile hitting ground - at high speed and penetrating it several meters - to stay intact including a homing device. No; one doesn't, does one? Perfect tinder for starting a bonfire of disbelief. "The warhead performed as predicted and met all expectations," said Elmer Lueker, the JASSM payload integrated product team leader in Phantom Works. "After experiencing shock loads as high as 12,000 Gs, there was no deformation of the casing and the fuze timing delay performed to the millisecond." The warhead struck the thick, reinforced concrete target, penetrated through it and traveled another half mile down range. The clean exit hole it left indicates that it had maintained the desired straight trajectory while traversing the thick target. First of all, they used a freaking excavator to unearth the stuff. Don't you think they'd be more careful if they actually thought there were any jet parts that might be damaged by heavy equipment? What about the people in the jet that was allegedly buried in the ground. Secondly, don't you think an excavator is a little heavy-handed for unearthing body parts? Clearly they knew there were no parts in there and they simply used an excavator to dig into the ditch, plant the plane parts and snap some photos. Furthermore, if they were to "sculpt" a plane-shaped ditch, you'd think they would have taken the time to make it look more like a plane and less like a dual missile impact. I ask again, when would you say the 'bomb' was planted? You've already displayed your ignorance on the capabilities of certain missile warheads, shall we repeat the lesson for their accuracy and fuse capabilities? Let's. Effectiveness, range, and carrier operability. warheads and seekers, and for extended range. The tag has sophisticated power management features to allow use over a long period of time (months)… Each tag can be installed on a witting or unwitting person, material, vehicle, ship, etc. Power is supplied by installed battery or host power source. The tag can be augmented with GPS to allow data logging for later exfiltration or geo-fencing functions (on/off when inside defined geographic boundaries). Bigfoot provides the warfighter with real-time tracking intelligence on potential adversaries conducting threat activities. penetrates through to the target. The fuze can distinguish between earth, concrete, rock and air. yet you repeatedly are not able to follow others, even they postulate much simpler things (here a mere difference of two photographs taken at different times). As it looks you aren't able to follow whenever they question your conjectures. One normally finds hardly imaginable a grown man unable to discern different surface patterns in two pictures of same place taken at diffferent times. Except of course doing it for purpose - to avoid painful questions. Actually experience tells me to expect others to ridicule, scoff and question my sanity (how does it feel to be so predictable? ), but it sure seems to me that I've answered every one of your decidedly painless questions quite nicely. What burning issues remain unaccounted for? They just murdered thousands of people and suddenly they would be tender-hearted that they would care about their bodyparts more than for the hijack-plane show? It doesn't seem plausible And if that what made the crater was a drone, missiles or planted explosives, there obviously wouldn't be any body parts there anyway. The "horror" card, always played by the disingenuous, right behind the "sanity" card. Pathetic. I expected more. And now you're demanding proof that such weapons don't have interchangeable targeting systems. Really? Now we're back to square one, namely dealing with your incredulity. Sorry man, I'm not here as your therapist. Yeah, after 12 @#$%ing years of watching the big-name "truthers" spin their wheels and lead us into dead-ends, I'm the one who's a #%^ing red-herring. Get over yourself. The capabilities of the missiles. The ear and eye witness accounts. And it's not proof but it's sure telling that when it comes to multiple missiles, the "OS" Believers, the "Modified Plane" Believers, the "It's all Fake" Believers, the "DEW" believers and the "Mini Nuke" believers all circle the wagons. No kidding. Looks like sumpin' else entirely to me. Your theory is not only not plausible. it is not possible. No, you just don't know what IS possible. If that was true, the missile would have exploded in the trees. And yet a missile DID explode in the trees! Well I say your inability to even consider the option is proof that it was more likely to succeed. Such incredulity is what 'big liars' count on. If I wouldn't consider the option I wouldn't try to discuss it with you, don't you think? "After experiencing shock loads as high as 12,000 Gs...traveled another half mile down range"
Now, for the starter and purpose of credibility evaluation try please calculate what the warhead's impact speed would need to be to travel "half mile" after experiencing "12,000Gs" deceleration - just for example: if my calculator works properly it means a deceleration of a 60in/1524 mm long warhead from say 300 m/s (AGM158 is subsonic, isn't it?) to zero at less than 3 milimeters?...does the warhead on top of other supernatural cappabilities teleport itself through the targets and beyond? First of all, they used a freaking excavator to unearth the stuff. Don't you think they'd be more careful if they actually thought there were any jet parts that might be damaged by heavy equipment? 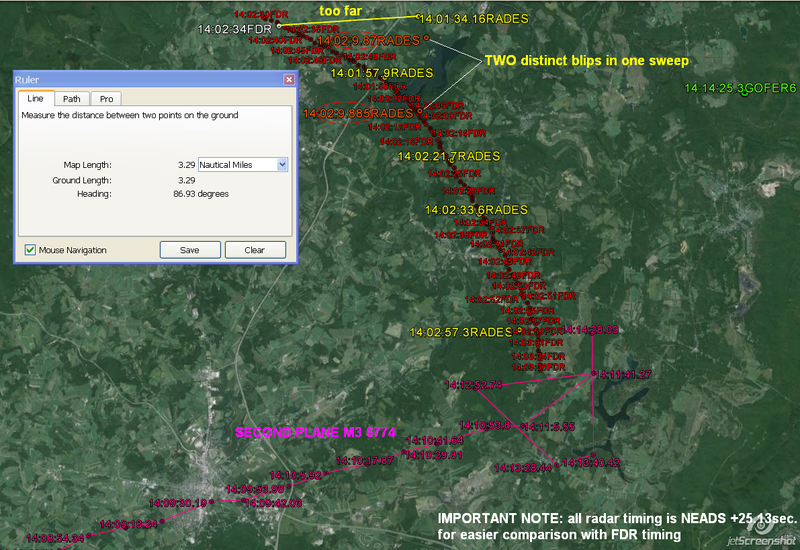 Nobody sober would expect jet parts undammaged after striking ground at 250 m/s. What an excavator can do to it on top of that? "don't you think an excavator is a little heavy-handed for unearthing body parts? I've seen a photo unearthing jet engine, I haven't seen it was unearthing body parts. But looks you have loads of insider information. Tell us more. Clearly they knew there were no parts in there and they simply used an excavator to dig into the ditch, plant the plane parts and snap some photos. I love this people who see clearly. "dual missile impact", nice term, we should forever remember who coined it. You've already displayed your ignorance on the capabilities of certain missile warheads, shall we repeat the lesson for their accuracy and fuse capabilities? Ignorance? Take some lessons in physics before you post withdrawn press releases with unbelievable numbers - at least to people who passed in physics at a high school. And anyway a fuse still isn't a homing device seamlessly cappable of transmitting for meter precission targetting after a ground impact at 100s of meters per second speeds. But nowadays they just plant a bug on a guy and send in a drone. You don't suppose such targeting systems just 'appear' overnight, do you? Of course you don't. Anyway, you look as smart man with answer to everything - do such bugs withstand impact into ground at 100s of meters per second? ...Somehowow I don't see anything like that in the specs. Still we somehow don't have answered the question about the evidence for the device at one missile homing other after it impacted ground and burried itself into it. They just murdered thousands of people and suddenly they would be tender-hearted that they would care about their bodyparts more than for the hijack-plane show? It doesn't seem plausible rolleyes.gif And if that what made the crater was a drone, missiles or planted explosives, there obviously wouldn't be any body parts there anyway. Is it only me who somehow don't see what your answer reacts on in the quote? Me neither yours and I lack expertise in delusions, but I'm just still avaiting the proof there ever was a device on missiles to precisely home other after impacting ground at the high speeds. ...No, of course not, herrings are small, stinky and too salted, you're a big clear dual missile impact truther and your version of the WTC and Shanksville attack looks to me as it must immediately succeed to persuade majority of your fellow Americans and any court and get the perps on their electric chairs. I'm just still awaiting you to come out with a 5gon dual missile impact theory. Then the circle will become full. I'm interested in the proofs. Until then I take you as no plane/video fakery/dual missile impact believer. For purposes of entertainment tell us please more about the entirely sumpin' else. He offered essentially 2 statements to the media. First said he found nothing. Second said he found bodies and airplane parts. Clearly conflicting statements. One must be true and one must be false. Which is true and which is false? It is not a non-answer to say he was part of the fraud, it is just an answer you didn't like. Can you think of any reason why he'd first say he found nothing but then changed his story? I can: most people would agree with his first assessment, giving him credibility with folks who noticed the same thing. Later after further investigation he said he did find plane and body parts, making the people who agreed with his first statement think that in spite of the fact that the coroner first thought there was nothing there, he was mistaken, making folks believe they were mistaken too, especially since they weren't on the scene like he was. He was part of the fraud. So now it is a three missile theory? First off, a missile did not explode in the trees, it exploded in the ravine and damaged the trees. Second, the damage was not in the path of the ravine that you say was caused by a missile. Third, there is no way that a missile with an 8' wingspan navigated its way through this dense grove of trees. This is not a discussion; you are disingenuous. Take it up with Boeing...I'm not sure what you find so funny. I guess you giggle when you're confused; I can just imagine what you might do when you're scared. Your logic gives me chills. Do crash investigations often include excavators in your world? You have a dizzying intellect for sure. The official tripe that you eat with a spoon states the deeper they dug with the heavy equipment, the larger the pieces they unearthed. Why wouldn't they be concerned they might dig up an arm or a head? From where did Wally Miller get the "DNA?" Did he sift through the excavator buckets? Who is this "we" you speak for? Do you hear voices? I can't say that anything you've written will be remembered past mid-morning. "Possibly" means you're guessing. Is there any evidence to support this guess? Was the gash dug far enough in advance for the grass grow over the gash or was it a fresh scar? It must have been a while before the big day else you'd see evidence of the heavy equipment in the form of crushed grass around the hole. Crater dimensions are a function of the kinetic energy of the missiles, angles of impact, and target material. Projectile density, shape, orientation, size, and velocity may also affect crater dimensions [Denatto, 1968; Denardo et al., 1967; Co. ok and Mortensen, 1967; Culp and Hooper, 1961], but these variables, which are known, may not be specified for all the missile impact craters. Nevertheless, the effect of the kinetic energy and target material on crater size can be illustrated by using crater radii and dis- placed masses. Desperate men clutch at any straw, but this still doesn't change the shape of the crater; obviously targeting wasn't an issue. I guess you're too young to remember the military bragging about sending smart bombs down chimneys. its location during much of the flight, defense officials said on Friday. Oh look, another faux-truther wanting to petition the court system that put Bush into office for redress. You probably would have demanded Hitler investigate the Reichstag fire. News flash, some of us are interested in the truth regardless how unpopular it is. So now it is a three missile theory? First off, a missile did not explode in the trees, it exploded in the ravine and damaged the trees. Unlike any of your theories, it is consistent with the evidence. So let me get this straight, a buried c.200 lb bomb created a 30 foot crater and the explosion and fireball was so huge that it broke, split and set fire to trees 120 feet away? I see you're still clutching at straws. What I've quoted - the numbers in the press release you've linked. Have you even a slightest idea what a deceleration means a "12,000Gs"? Recall, you couldn't imagine how the missile warhead could survive the impact. strawman - I was talking about the homing device, not warhead. I can almost imagine what might you do. You have a dizzying intellect for sure. The official tripe that you eat with a spoon states the deeper they dug with the heavy equipment, the larger the pieces they unearthed. Why wouldn't they be concerned they might dig up an arm or a head? Arm, head? After a 200+m/s crash? Your intelect must be dizzying for sure. From where did Wally Miller get the "DNA?" Did he sift through the excavator buckets? Who is this "we" you speak for? Do you hear voices? I can't say that anything you've written will be remembered past mid-morning. I'm almost sure the "dual missile impact" zinger will be. The bomb at the site together with planted plane parts as well as the possibility of the gashes being at the site before the 9/11 are possibilities which are neither proven nor excluded. It is not a claim of the kind the two missiles of very certain type impacted the former mining site homing one on the other - which moreover very much looks like you first have this conjecture and only then you search for evidence to satisfy your confirmation bias, immediately insulting everybody who doesn't buy into it at face value - which alone definitely raises red flags already when one considers the style you present your case. Two missiles is remotely maybe one possibility. But until you have hard evidence for it, not conflicting with such things as the forest in the way of one of them it is nothing more than that. Yes. Ignorance begets disbelief. Perhaps you can use your physics to explain how the crater is not consistent with a missile impact. I haven't claimed the crater is inconsistent with a missile impact. 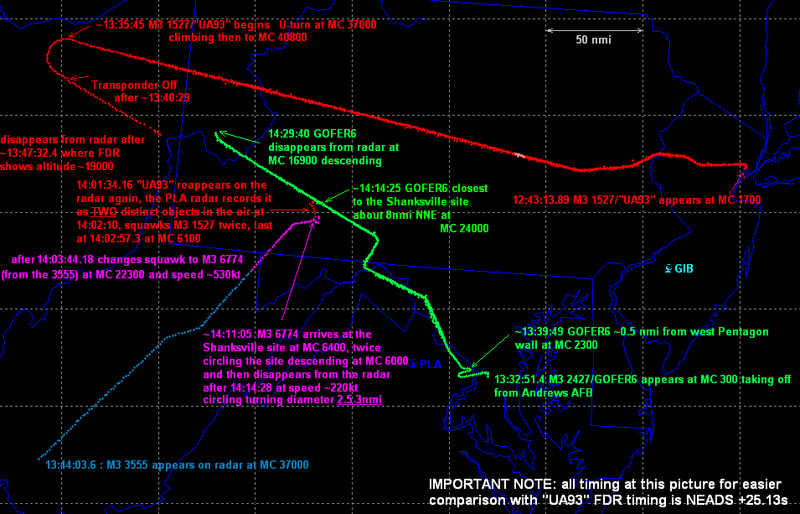 I even gave you a hint why it could be consistent with two events - impact and subsequent explosion in the middle. But still I don't see any evidence for two missiles there. If a rationale to use a hard target penetrator would be the creation of the gashes the missile impacting ground at high incidence angle could easily get deflected by the harder bedrock at the high incidence angle and create both the gashes. (mind how straight the line of the two gashes is! The missiles would need to approach at exactly opposite trajectories). 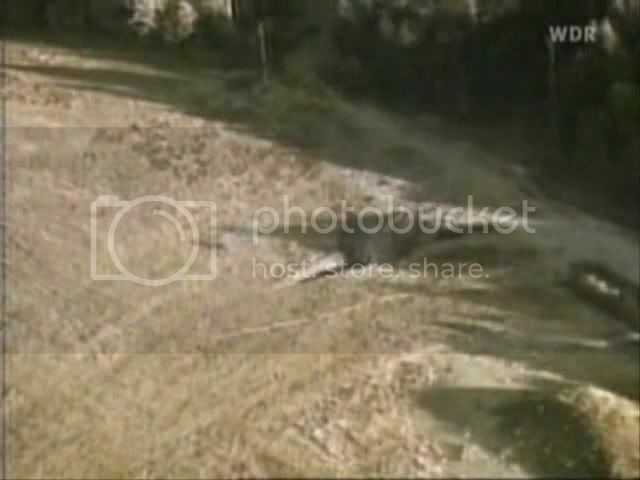 In fact it seems to me on the other hand quite difficult to imagine how a hard target penetrator would get in rest just couple of meters behind the touchdown point in soil which has known history of digging in it so with likely loose compactness and easily penetrable by something like AGM158. 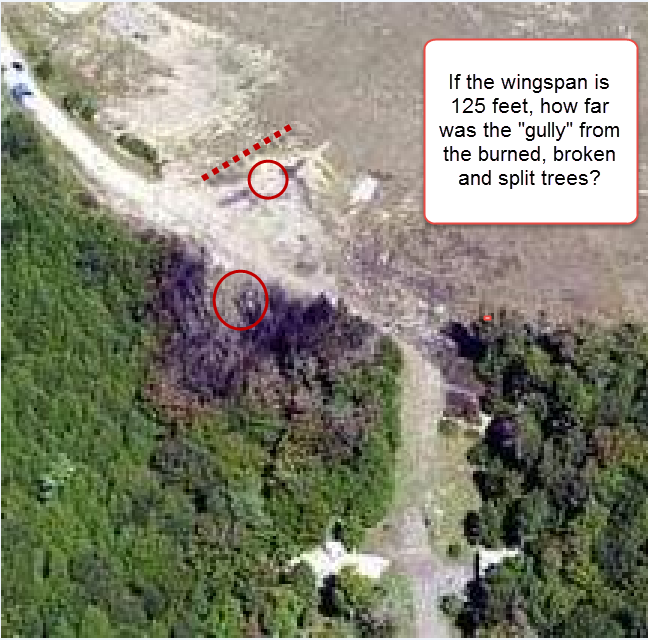 For me also definitely doesn't seem plausible a cruise missile dependent on having intact wings for the control of its flight would be able to approach the site at high incidence angle from the side of the forest for a high incidence angle impact - at least not with sufficient certainty of a success - the trees look to me too close for changing descent angle from needed ~40° to clear the trees to your 10° impact angle. A penetrator is not a meteorite, it is contructed to NOT explode on impact and explode only when it reaches certain density of material it is penetrating, so I can imagine it striking the ground, burry itself in it, seriously dammage or completely loose its wings, get deflected by more compact bedrock below, making the other side of the gash, reemerge into air in uncontrolled flight and with possibly seriously impaired aerodynamics, and then its warhead explode into the then destructed tip of the forest behind. Desperate men clutch at any straw. Yes the straws are there on the site in the gash (at least we see them on the photo) - made allegedly by the AGM158 together with other AGM158 from the other side in your so far desperate hypothesis you try carbon print on WTC too. but this still doesn't change the shape of the crater; obviously targeting wasn't an issue. I guess you're too young to remember the military bragging about sending smart bombs down chimneys. When you are guessing about my age it is good occasion to ask you how old are you and how long you are researching 9/11? Why would you think a tiny solid-state beacon would be damaged by a deceleration? A homing device must have functioning aerial and emit radiowaves with sufficient range and for sufficient time for the other missile to acquire the signal to lock on it and because I happen to have education in electronics I hardly can imagine such device with needed source of energy and aerial function together properly and with sufficient certainty burried meters under ground after a high speed impact. A transmitter is something pretty different than a fuse basically based on the extreme acceleration changes. It was well protected from damage by the warhead as shown in the test data you claim is B.S. There wasn't a word about a homing device in the test data. This site is more about research, facts, not unsubstantiated perseverative conjectures. Can you see difference between G loads during a space launch and G loads on ground impact at 100s m/s speeds? So tell me, why would you think the beacon would be damaged by the deceleration? I still don't see rationale why not plant a homing device on the site, why it must undergo the high Gs impact with uncertain result in the first place. Is it because you still can't imagine a missile warhead staying intact as it passes through rock and soil? - I can imagine it, I just don't see it necessarily needing to carry the homing device for the effect. There are also different ways how to home missiles and bombs and the presence of unidentified circling plane around the site at relatively low altitude could point to such directions. Oh look, another faux-truther wanting to petition the court system that put Bush into office for redress. You probably would have demanded Hitler investigate the Reichstag fire. I would bet that repeated oafish insults really don't make good impression here, especially not among senior members of this forum who sacrificed years of their time to serious research into government sponsored terrorism an figuring out what to do about it. In my case since 1997. So please avoid them next time. I suggest you to read the rules of this forum and follow them before it is too late. Whether you are right or not with your hypothesis, which I initially deemed worth to examine, I don't know, but I'm member of this forum long time enough to be sure that intensifiying your frustrated rudeness definitely will not help your cause an inch and continuation with this pushy style will definitely not open you here any way to be taken seriously a slightest bit.